The new pen or mouse? At Cebit, I saw a New Zealand based company called Simtrix. 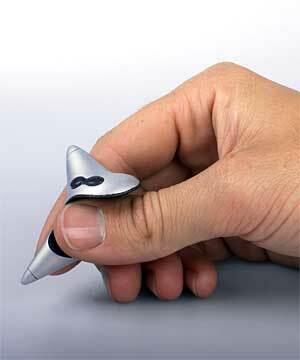 They have designed this new input device (Triped) that seems to be a crossing between a mouse and a pen. It is basically a redesign of a Wacom pen (the kind that is used for Tablet PCs), using the exact same technology (one of the three ‘peds’ contains the pen sensor). 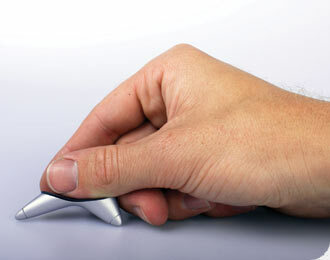 One of the main advantages compared to a pen is that the Triped can stay in position on a tablet or display and therefore it is easier to grab it. This can be very efficient if you are frequently typing on a keyboard and need to navigate in between. Also, the Triped can detect if you are holding it as a pen and automically switch from navigation into drawing mode (no need to change modes by manually selecting a pen icon). Other potential features are possible when the remaining two ‘peds’ are also equiped with pen sensors or when the Triped is used onto a touch sensor. Changing the holding position of the Triped might give you access short cut keys or work as scrolling and zooming functions. This kind of behavior is compareble to gestures and flicks that are detected with a multi-touch sensor (such as on the Iphone). This entry was posted on Tuesday, March 11th, 2008 at 4:39 pm and is filed under New products & technologies. You can follow any responses to this entry through the RSS 2.0 feed. You can leave a response, or trackback from your own site.